At the time of its release, What the BLEEP Do We Know?! was a new type of film – part documentary, part story, and part elaborate and inspiring visual effects and animations. 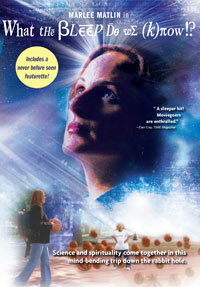 The protagonist, Amanda, played by Marlee Matlin, finds herself in a fantastic Alice in Wonderland experience when her daily, uninspired life literally begins to unravel, revealing the uncertain world of the quantum field hidden behind what we consider to be our normal, waking reality. As we watch Amanda struggle to understand the fundamental premises of her life, we see commentary on her search from a host of top scientists and mystics who serve as a modern day Greek chorus. Their wisdom and ideas are woven together as a tapestry of truth, adding emphasis to the film’s underlying concept of the interconnectedness of all things. First released in theaters in 2004, What the BLEEP Do We Know!? went on to become one of the most successful documentaries of all time. Now distributed in more than 30 countries, it has stunned audiences with its revolutionary cinematic blend of dramatic film, documentary, animation and comedy, while serving up a mind-jarring blend of Quantum Physics, spirituality, neurology and evolutionary thought.